"They" said it couldn't happen. Despite the inherent power of John Edwards' hair and boyish charm. . .
despite Hillary's war chest, husband, and testicles. . .
despite the cows and corn and cholesterol-ridden cafes. . .
Barack has won the 2008 Iowa caucus by a veritable landslide. 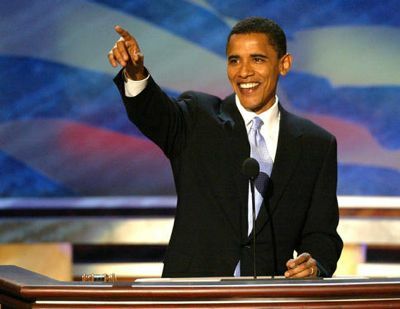 Congratulations, Senator Obama. I appreciate your vision of hope and your inclusiveness; I worry about your lack of experience and am suspicious of your juris doctorate (alas, all the Democratic front runners are lawyers--along with their spouses). And I still think I want to see Hillary in the White House and Bill as the First Husband. Nevertheless, I'd vote for you a million times before casting one vote for Mike Huckabee. We'll see you in New Hampshire. Get some rest. Darling I still think Edwards will suprise us all come Iowa. This is shaping up to be quite a year, I haven't been this excited since McKinley and Roosevelt! Ooops! Darling did I say "Iowa" I meant New Hampshire, this is what happens when I mix Boniva with Gin! Ha! Boniva and gin. I'll have to request that the next time I go to the speakeasy. Darling what do you think keeps Sally Field so well pickled.